Building on the success of its award-winning DAB/FM modules, RadioScape has announced the RSC03 clock radio subsystem. It is the first of a new family of DAB subsystems and provides an even higher level of system integration for manufacturers. This reduces costs, design complexity, and, most significantly, can substantially cut time-to-market for radio manufacturers in this product category. Phil Smith, RadioScape's Senior VP for Sales and Operations, said, "Increasing the level of integration has proved very popular with our customers, allowing them to fully evaluate the product on day one." Another first for RadioScape is being able to offer a custom display to complement the subsystem. 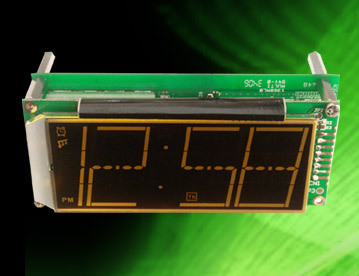 "Clock radios require something different to the LCDs commonly used on other DAB products and we have invested to support our customers with a large, easy to read display that is specially designed for clock radio applications," he said. The RadioScape RSC03 is a complete DAB/FM clock radio subsystem that only requires an external DC power supply, speaker, LCD display, button board, and enclosure to complete the product. The need for a motherboard is eliminated as the power supply and audio amplifiers are fully integrated into the subsystem. This reduces the manufacturing steps to just one assembly run. Its construction and compact form factor makes it suitable for many enclosure designs. The subsystem approach once again leverages RadioScape's flexible software defined radio architecture, which enables customers to easily create product differentiation by changing and adding features via software as required. "This combination is unique to RadioScape and will allow our customers to bring products to market in less than 100 days," added Smith. The clock radio features that have been incorporated include an auto back light dimming option, off-air time update, automatic daylight saving, 3 programmable alarms, five presets, Sleep and Snooze. The individual alarm volumes can be programmed to rise to specific levels, independently of the main volume. RadioScape can also supply a large character custom LCD that is ideal for this application with a choice of blue STN and blue or amber TN. The LCD and subsystem form a single unit measuring only 109mm by 50mm by 32 mm. A number of customers have already started production of DAB clock radios using the RSC03, which will be in the shops soon. Simon Parslow, Director of New Product Development and Marketing at Acoustic Solutions, said, "Using the RSC03 meant we had something to demonstrate to the retailers right at the start of the project. Designing in the RSC03 was very simple and enabled us to get the first products rolling off the production line in just 90 days." RadioScape® Ltd. is the world's only developer of end-to-end digital audio broadcasting solutions giving RadioScape unmatched systems knowledge and enabling it to ensure that customers receive the highest levels of quality, robustness and reception at all stages. Its Digital Radio Broadcast Suite is used extensively throughout the world including the largest DAB installation to date -- the UK's commercial DAB network. This is also being used to roll out Mobile TV services using Digital Multimedia Broadcasting in many countries, particularly in the Asia Pacific region where there are already many installations in China. RadioScape's innovative Software Defined Digital Radio™ approach has made it a leader in DAB and DMB technology with its DAB receiver modules being extensively used by many of the world's leading consumer electronics manufacturers. The company has recently begun shipping its first generation of DRM/DAB modules, enabling multi-standard consumer receivers to reach retail this year. RadioScape is a registered trademark and Software Defined Digital Radio is a trademark of RadioScape Limited. All other trademarks are acknowledged.